For other people named Ruth White, see Ruth White (disambiguation). Ruth Patricia White (April 24, 1914 – December 3, 1969) was an American actress who worked in theatre, film, and television. She was an Emmy Award and Obie Award winner and also a Tony Award nominee. A lifelong resident of Perth Amboy, New Jersey, White attended St. Mary's High School and graduated with a bachelor's degree in Literature from New Jersey College for Women, now Douglass Residential College, Rutgers University in 1935. While pursuing her acting career in nearby New York City, she taught acting and drama at Seton Hall University. During this period, she also studied acting with Maria Ouspenskaya. White began her acting career in 1940 as an apprentice at the Cape May Playhouse. Late in World War II, she spent six months in Alaska and the Aleutians touring with a USO troupe. For five years, beginning in 1948, she was the leading resident actress at Bucks County Playhouse. White's Broadway debut came in The Ivy Green (1949). White's career was delayed in the late 1950s while she nursed her ailing mother. During her mother's illness White gained weight and looked older than her age. However, she managed to recover and appeared in off-Broadway plays of Samuel Beckett ("Happy Days") and Edward Albee ("Malcolm" and "Box"). White also earned a Tony Award nomination in 1968 for her role in Harold Pinter's "The Birthday Party." By the end of the 1960s, she had become one of New York's most highly praised and in demand character actresses, and appeared in Midnight Cowboy, Hang 'Em High and No Way To Treat A Lady. White's final film role was in The Pursuit of Happiness, released 14 months after her death. In 1962, White won an Obie Award for Distinguished Performance by an Actress for her work in the play Happy Days. In 1964, she won an Emmy Award for her role in the Hallmark Hall of Fame TV Movie Little Moon of Alban. White, who never married, died of cancer on December 3, 1969. She is interred with her brothers Charles and Richard in their family plot at Saint Mary's Cemetery, Perth Amboy, New Jersey. 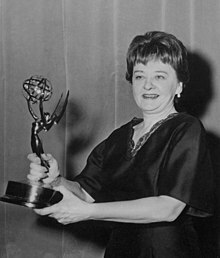 The Twilight Zone episode "The Incredible World of Horace Ford"
^ "RUTH WHITE, 55, OF STAGE AND TV; Actress Who Won Emmy in Little Moon of Alban Dies", The New York Times, December 4, 1969. Accessed November 14, 2017. "Ruth Catherine Whie, born April 14, 1924, into a family that had been in Perth Amboy for more than 150 years, was the daughter of Charles V. and Jane Gibbons White, She attended St. Mary's High School in her hometown and was graduated from Douglass College in New Brunswick, N. J." ^ a b Brown, Doris (16 April 1961). "Perth Amboy Actress Wins Acclaim In Role in 'Big Fish, Little Fish'". The Central New Jersey Home News. New Jersey, New Brunswick. p. 31. Retrieved December 11, 2017 – via Newspapers.com. ^ Brower, Millicent (17 October 1961). "Actress Ruth White Performs Entire Role While Buried in Sand Mound". Lubbock Avalanche-Journal. Texas, Lubbock. WNS. p. 2-B. Retrieved December 12, 2017 – via Newspapers.com. ^ "Ruth White". Internet Broadway Database. The Broadway League. Archived from the original on 12 December 2017. Retrieved 12 December 2017. ^ "("Happy Days" search results)". OBIE Awards. Village Voice and American Theatre Wing. Archived from the original on 13 December 2017. Retrieved 13 December 2017. ^ The Complete Directory to Prime Time Network and Cable TV Shows, 1946-Present. Ballantine Books. 2003. p. 1416. ISBN 0-345-45542-8. ^ Doyle, Marion (9 December 1969). "Countless Friends Mourn Ruth White". The Central New Jersey Home News. New Jersey, New Brunswick. p. 8. Retrieved December 12, 2017 – via Newspapers.com.